Sharing a common set of concerns which are mobilised to defend core societal values – including social justice, equality, fairness, care for the other and humanity – authors raise questions about how the omnipresent media can contribute to the materialisation of these core values, and how it can sometimes work against them. 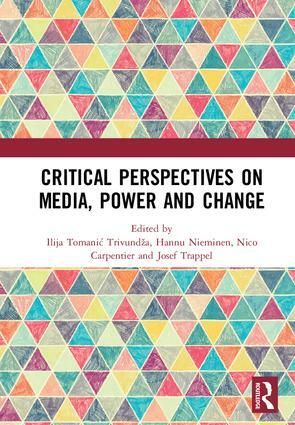 Addressing issues such as rethinking social change, mediatisation and regulation, the authors demonstrate how the role of the critical media and communication scholar merits and requires (self-)reflection. Critical voices matter, but they also face structural limitations. This book was originally published as two special issues of Javnost: The Public. Hannu Nieminen is Professor of Media and Communications Policy, and Dean of the Faculty of Social Sciences, at the University of Helsinki, Finland. Nico Carpentier is Professor of Media and Communication Studies at Uppsala University, Sweden. He also holds part-time positions at the Vrije Universiteit Brussel, Belgium, and Charles University, Prague, Czech Republic. Josef Trappel is Professor of Media Policy and Media Economics, and Head of the Department of Communication Studies, at the University of Salzburg, Austria.